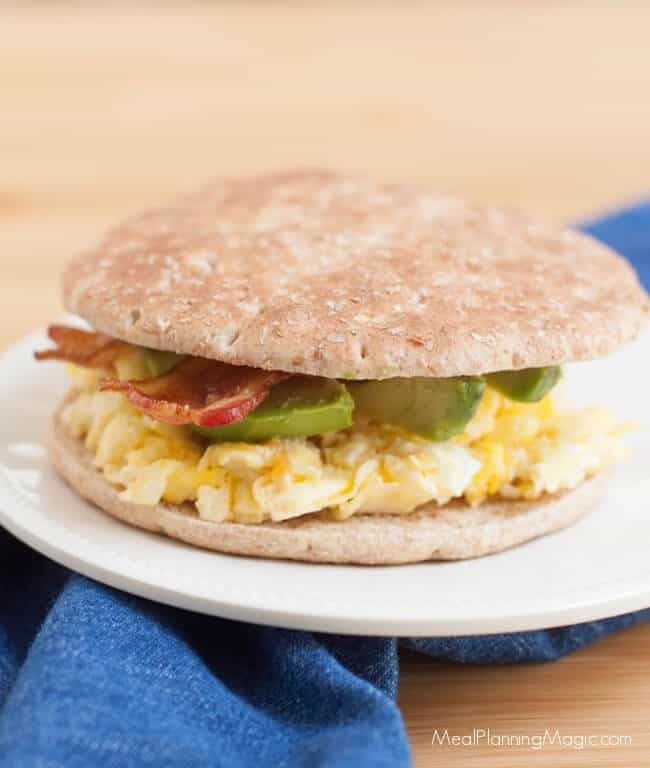 Only four ingredients, this Quick and Easy Egg Bacon Avocado Breakfast Sandwich is a tasty, satisfying on-the-go breakfast option. And much of it can be made ahead too! If you’ve been following me awhile, it’s no secret, breakfasts are a challenge in our house so it seems like I can never have enough simple recipe ideas. 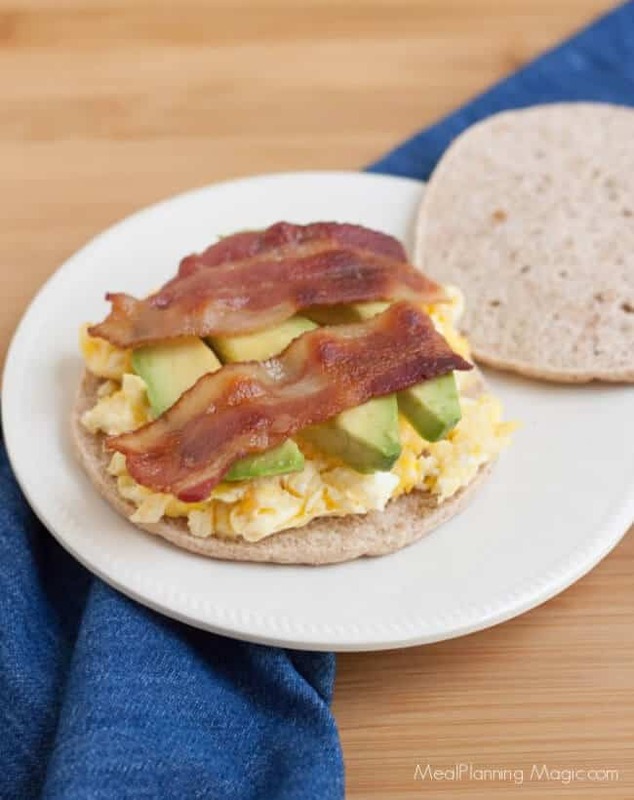 Sometimes I just need a meal that is easy to prepare and tastes good too like this Quick and Easy Egg Bacon Avocado Breakfast Sandwich. I originally shared this recipe back in the spring of 2014 but I’ve updated it a bit because it was worth sharing again and it needed some new photos. The recipe featured pocket bread that is no longer made so I’ve also updated it to make it with sandwich thin bread. I like sandwich thin bread because it’s just enough to hold the ingredients and not be too much bread to filling ratio. Can you relate? When we have a sandwich we want to be able to taste what’s inside and not just all the bread! It seems like avocados are a staple in our house so I love adding them to just about any meal I can. Actually, my family will eat them plain and just sliced we love them that much! I can usually find them for a great price (although it does vary depending on the season) at my local ALDI store. With just four ingredients, you can do some of the prep ahead of time too. 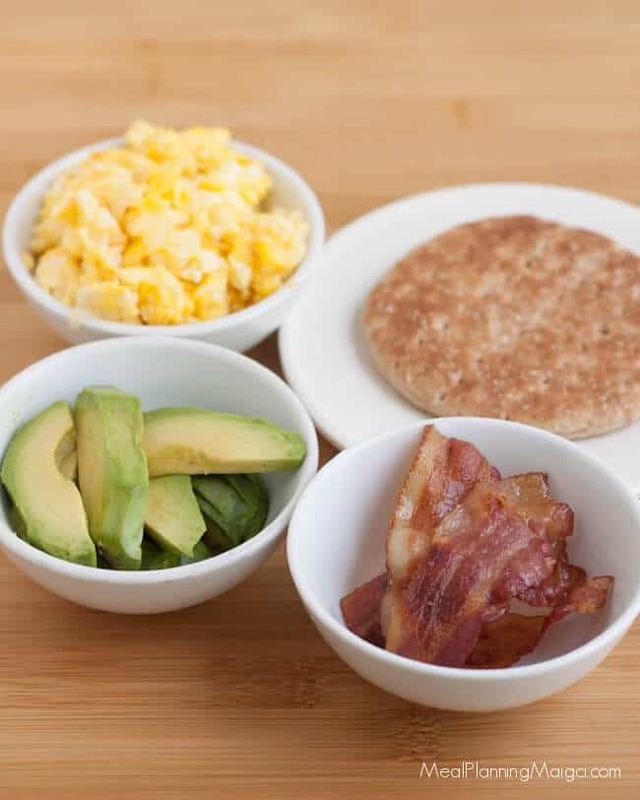 Scramble the eggs and bake (or fry) the bacon the night before then all you need to do is slice up the avocado and assemble everything before enjoying. 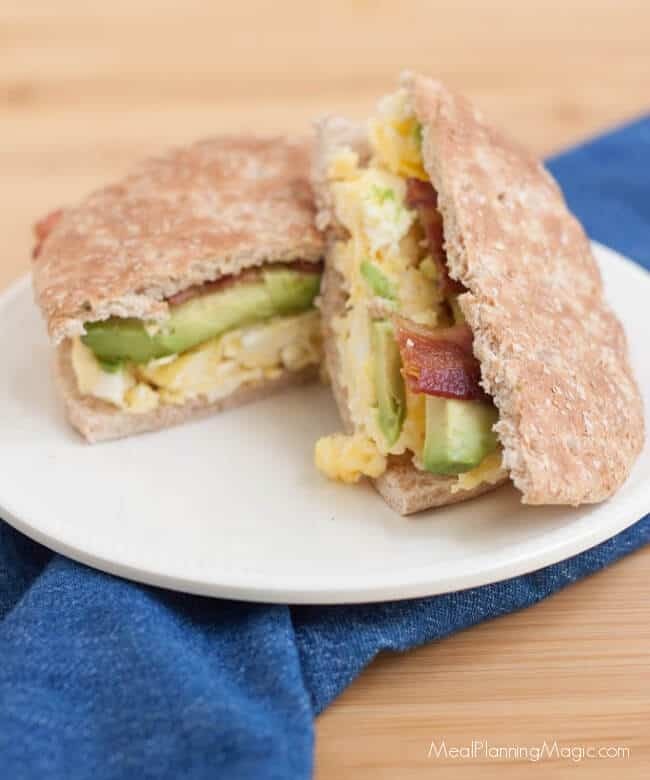 This Quick and Easy Egg Bacon Avocado Breakfast Sandwich is one of my favorite quick and easy breakfast recipes! 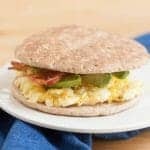 This is a great breakfast on-the-go idea but it would also make a simple lunch or dinner idea too. Add some fresh fruit too—yum! Break eggs into small bowl. With a fork or whisk, whip eggs until broken up and blended. In medium saute pan, scramble eggs. Remove from pan and set aside. In same medium saute pan, fry bacon until you reach desired doneness. Starting with one sandwich bread (top & bottom), add half the scrambled eggs, half the cooked bacon and half the sliced avocado. Add salt & pepper to taste. Top with other half of sandwich thin. Peanut Butter Chocolate Banana Latte (aka Chicken Fried Latte) — funny name, tasty smoothie—trust me!